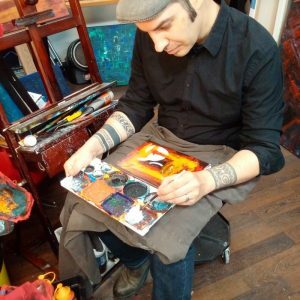 The Central Art Walk is a yearly studio tour and sale in the beautiful Kitchener neighbourhoods bounded by King, Victoria, Weber, and Union streets. Come visit, and get a chance to see artists in their own studios, displaying fine art, jewelry, paintings, food, photography, pottery, glass, collage and fibre arts. For art walk information, email info@centralartwalk.com. For website information, email webmaster@centralartwalk.com. If you want to be added to our mailing list and notified when an important update occurs, please sign up for our newsletter. To be removed from our mailing list, please follow the “unsubscribe” link in your email, and we will no longer contact you. All images and quoted text reproduced in this blog are copyrighted by the specified artists and authors. None of the images or quoted text reproduced here may be used or copied in any way without express permission from the artist or commenter. Where not otherwise specified, this work (i.e. blog) is licensed under a Creative Commons License permitting non-commercial sharing with attribution.